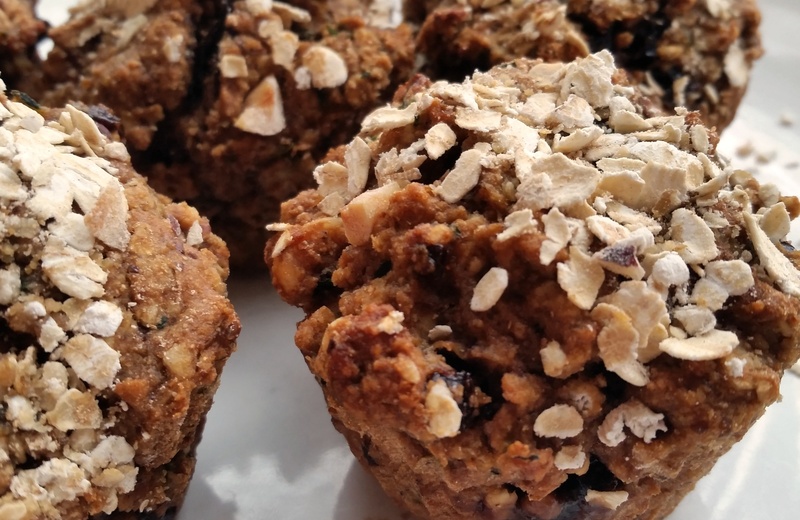 These muffins are chock-full of goodness: whole grains, hazelnuts, cherries, apples, and zucchini, plus a little booze to make everything even better. Assembling the muffins requires more steps than my usual recipes, but the taste makes it worth it—or so my non-vegan taste testers told me between bitefuls. Toss the oats and hazelnuts and spread evenly on a cookie sheet. Toast in a 400°F oven until slightly golden (about 12 minutes), stirring once or twice. Let cool. Heat the cherry liqueur in a small saucepan. Add the dried fruit and simmer for two minutes, then let rest until cool and most of the alcohol is absorbed. Set aside a quarter cup of the oat and nut mixture. Put the rest in a mixing bowl with the flours, baking soda and cardamom. Mix together. Mix the applesauce, zucchini, water, oil, sweetener, lemon extract, and flax together in a separate bowl. Sprinkle the tops with the oat and hazelnut mixture that you set aside earlier.